DND Flyway will cost you more from November 1 midnight. For cars you have to pay Rs 22 instead of the current Rs 20. 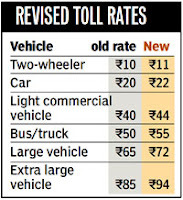 The 10% hike comes eight months after the Noida Toll Bridge Company Limited (NTBCL) effected and, under pressure, rolled back a 25% hike in toll tax. About one lakh vehicles use DND Flyway every day. Of them 75,000 are cars, of which only 25,000 cars are card holders. “More car owners will be encouraged to use pre-paid cards,” said the official. The official claimed that after the Gurgaon toll plaza murder, a lot of money was being spent on improving security. “Plus, we’re revamping the link in view of the F1 race,” he said.